Do crooked and misaligned teeth often cause you to hide your smile? If so, you have probably considered braces in the past; however, metal wires and brackets will likely cause you to feel more insecure about your appearance. Not to mention, you do not want to deal with the restrictions that come along with them. Now, you can get the results you want with a nearly invisible solution. At Bristol Family Dental, we offer Invisalign to give you a beautiful, straight smile. 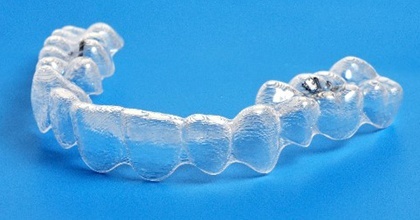 Invisalign is far different than traditional braces because it does not use brackets or wires to move your teeth. Instead, a series of custom-made clear aligners are worn over your teeth to gradually move them into position. This FDA-approved treatment has quickly become the preferred choice among adults because it is virtually undetectable. As a result, you gain a sophisticated solution to smile confidently through your treatment. Invisalign resolves many of the disadvantages of traditional braces to provide you with a convenient solution. Since the aligners are removable, you will not have any dietary restrictions. You can still eat and drink what you like; however, you should not have anything expect water while wearing them. In addition, oral hygiene is also easy because you do not have to clean around brackets or wires. Invisalign is also the perfect solution if you have a busy schedule. You will not need to have appointments for adjustments, so you will spend less time in the dental office. Although, you will still need to come in every few weeks to allow us to monitor the movement of your teeth. Invisalign is effective for correcting an array of bite and alignment concerns, but it is not right for everyone. If you have severely gapped, rotated or tilted teeth, you may need another solution. However, if you are a candidate, you can get the results you want in about a year if you use the aligners properly. You must be committed to wearing them for about 22 hours each day while taking the time to care for them. Every week, you will switch to a new aligner to move your teeth. At the end of your treatment, you will briefly require a retainer to prevent them from moving back into their previous positions. To create a customized treatment plan, you will first require a consultation. If we determine that you are a candidate, we will use digital impressions of your mouth to create the aligners. Using state-of-the-art technology, we can even show you what your new smile will look like before you commit to your treatment. During your consultation, we will take the time to answer your questions and concerns to ensure a successful journey to a straight smile. We will also provide you with an estimate and discuss your payment options. If you are ready to invest in your confidence, it is time to see if Invisalign is right for you. Schedule your consultation for a straight smile today with Bristol Family Dental. If you still have questions about Invisalign, visit our frequently asked questions page where you’ll find the answers to some of the Invisalign questions we hear most often. You should also feel free to reach out to our Bristol dental office team. We’re always here to help.